after winning the First Opium War in 1842. 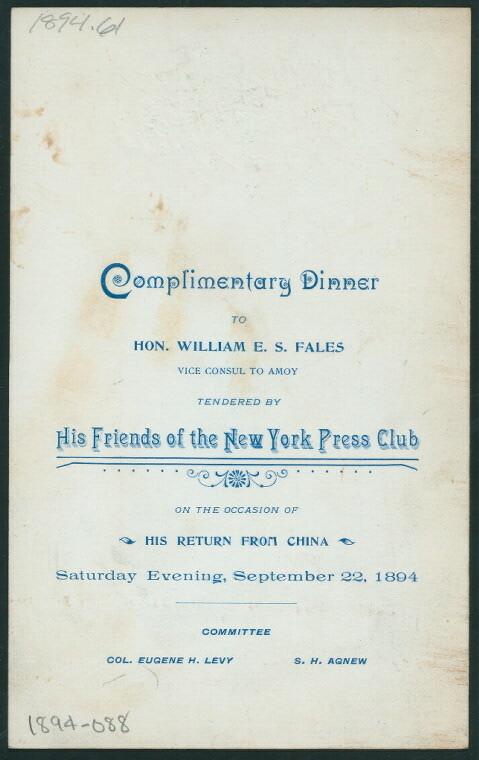 On a beautiful fall day in 1890, the newly appointed emissaries William E. S. Fales and Edward Bedloe went off to China on the S. S. New York. I imagine them on deck, waving goodbye to no one because neither man had, at the moment, anyone special in his life. Between them, Bedloe actually possessed qualifications, having served in the American Consular Service in Italy and Egypt. Fales’ fluency in Chinese would be an asset, as well. Both men were fascinated by Chinese culture: Bedloe with etiquette and weaponry; Fales with decorative art and food. Messrs. Bedloe and Fales were heading to Xiamen, which Westerners called Amoy, a port city about 300 miles northeast of Hong Kong, along the Taiwan Strait. They would arrive at a country stuck in time, except for a dramatic escalation of foreign intrusion. During the Empress Dowager’s regency, the United Kingdom and increasingly the United States, Russia, and Japan expanded their control through treaty ports. 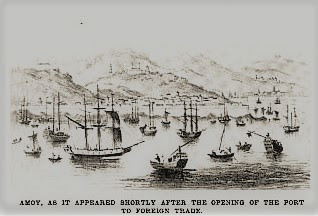 Treaty ports originally were established by the British after they defeated China in the First Opium War. The treaties governed trade on terms never favorable to China. They also created districts within each port city, inhabited exclusively by foreigners who answered to no one. Fales and Bedloe resided in such a neighborhood. 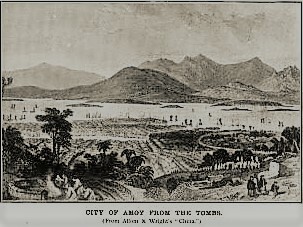 Since Amoy was a treaty port, the men focused on American trade interests. They were pleased to find that Far East markets enthusiastically sought anything that came from the U.S.
. . . the filling of American flour bags with poor imitation British flour; filling canvas covers of Chicago ham and bacon with really unmarketable pork; putting up Siberian salmon in exact imitation of the best salmon canned in California and Oregon, and selling cheap imitations of Ames’ shovels, Collins’ axes, McCormick’s farming implements . . .
One example [of fraud] was an imitation Winchester rifle made in Belgium by an English firm of the lowest grade materials, which was liable to kill the man who fired it as the man or animal it was fired at. What else demanded the attention of Bedloe and Fales? rituals of death and burial. Like most Westerners, Fales and Bedloe were fascinated by the hillsides of Amoy. Across the centuries, the slopes had become packed with tombs. In some parts of the walled city, there were no boundaries between burial grounds and private property. “Amoy proper and its suburbs have a living population of about one million, and a dead one of four and a half times as many,” Bedloe informed the U. S. Government. In the Journal of the American Medical Association he affirmed Amoy’s “reputation as the dirtiest city on the face of the globe,” describing open cesspools and impassable roads. Despite the dirt, China intrigued and delighted the men. Both were well-educated, sharp observers, and fine writers. They supplemented their annual salaries (Bedloe: $1,490; Fales: $354.19) by writing for various U. S. newspapers and magazines. You have no idea, my dear Stoddart, what an inexhaustible supply of literary material this ancient civilization possesses . . . my daily life here is one mass of surprises and arrangements. They do everything that we do, but in exactly the opposite way. Now I have two pretty poems from the facile pen of my wicked Vice which I will bring on to you in January or February. You shall have the first bid on them. They are truly great and I hope you can afford to buy them. It appears that editor Stoddart, who had previously published poems by Fales, decided to pass. Fales’ stories fared better: “Chinese Armor,” “”Chinese Statuary and Figures,” “Driving out an Evil Spirit,” “Fortune Telling in China,” “The Pharmacist in the Far East,” “Chinese Little Devils,” and others appeared in American papers between 1891 and 1894. By mid-September, W. E. S. and Margherita had returned to Brooklyn. Fales reestablished himself in law and journalism and resumed his love affair with Chinatown while Hamm wrote books and lectured. 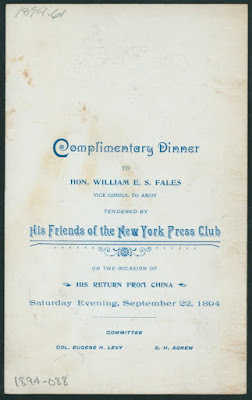 The New York Press Club – a rowdy bunch – welcomed back William with a dinner featuring Punch a la Chinois. *Hamm claimed that she and Fales were in Korea when the Sino-Japanese War began August 1, 1894. She reported that she had witnessed attacks on the palace in Seoul and an assassination attempt on Queen Min of Korea. However, Fales and Hamm were back in the U. S. by September 22, 1894 . . . and sailing time would have been at least 80 days. *See posts 1/25/17 + 2/14/17; also 5/25/16. So many sentences I love here, but chief among them is: "First she stood in for her son, Tongzhi, who died young of smallpox or venereal disease or both; then for Guangxu, her sickly nephew who advocated national modernization. (She had him poisoned.)"